This entry was posted on Friday, July 29th, 2011 at 11:07 and is filed under GOP Candidates, Politics. Much as Republicans in the country can’t wait to see Obama go, they’re less certain that Mitt Romney is the guy to make that happen. While he currently leads the GOP field, at least among announced candidates, the evidence indicates that even were he to win the nomination, he might have trouble energizing the all-important TEA Party independent vote that will play a substantial role in the 2012 Presidential race. His problem is best described as the inability to attract and convince actual conservatives. He’ll do well in the northeast, but the truth is that where most of the conservatives in the country are concerned, Romney is little more than ‘Obama Lite,’ and that’s what Obama is betting will be voters’ ultimate determination. The reasons for Mitt Romney’s problems among conservatives really can be condensed into an issue consisting of two parts: They accurately perceive that he is not one of them, and having properly recognized this, they become justifiably annoyed at his at his insistence that he is conservative. While he’s not about to join McCain in calling the Tea Party ‘Hobbits,’ the truth is that there’s no love in the Romney camp for either the Tea Party segment, or the staunchly conservative base of the party. Part of this grows from the fact that he won’t sign on to various Tea Party pledges, but his more enduring problem is that he simply isn’t a conservative. One of the most glaring examples of his tendency to statism is the much-referenced “Romneycare” in Massachusetts. That program suffers from a number of fatal flaws that are mirrored by Obamacare, but one of the most politically unpopular aspects is the mandate. Romney staunchly defends the mandate on two basic grounds, and after some consideration, I’ve concluded that he’s wrong on both. First, he offers that this is different because it’s a 10th Amendment issue. This is an issue for the individual states, and its reserved exercise of its powers, he argues. Of course, this holds that the people of his state aren’t entitled to the protections of the constitution with respect to this law. Many constitutional arguments can be raised about such mandates, and most of them revolve around the bill of rights. If the state has the right to mandate the purchase of healthcare insurance without restraint, why not cars, or houses, or cracker jacks? Romney’s other argument is the oft-repeated, and easily refuted analog to car insurance. He’ll point out that you’re required to have car insurance, so why not health insurance? Honestly, this argument is used in defending the mandate in Obamacare, and it’s perfectly baffling that anybody is convinced by it. State mandates to purchase auto insurance only require you to obtain liability coverage. If you want comprehensive, collision, and any other sort of coverage above basic liability, that’s up to you. The lien-holder may require more, if you’ve financed the car, but that’s a private contractual matter. The simple fact is that the only basis for any legitimate claim of the state to mandate auto liability insurance is to cover the losses and damage you might inflict upon others, but not the damage or loss you may suffer on your own. How this is a concept in any way applicable to health insurance has always baffled me, but emanating from the mouth of an alleged conservative, it’s terribly damning. On the issue of the 2nd Amendment, and gun control, Romney tries to walk an all too fine line between the base and the northeastern establishment’s reflexive mood on the subject. I’m waiting for the moment in which Romney is pictured, like John Kerry, shotgun in hand, hunting clay pigeon, dove, or duck, but I fear the only ducking he’ll be doing is when he made his claim to having been a life-long hunter. In Keene, N.H., in 2007, Romney had said: “I purchased a gun when I was a young man. 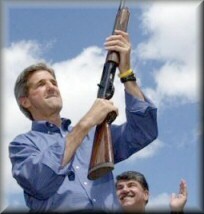 I’ve been a hunter pretty much all my life.” Sure, Mitt. What this reveals about Mitt Romney’s views on the 2nd Amendment is what gets him into trouble with conservatives: He thinks the 2nd Amendment’s primary purpose is to permit hunting. This absurd view of the purpose of the 2nd Amendment is widespread among the country-club set of the Republican party establishment, and it’s one more reason people on the right view Romney with skepticism. On a host of other issues, Romney seems difficult to pin down. It isn’t so much that his stances are intolerable to conservatives as it is that his unwillingness to take a firm position makes supporting him impossible. Call it the “conservative litmus test,” if you like, but whatever you call it, while Romney may fetch out an answer pleasing to conservatives once in a long while, it’s unconvincing and frequently opposed by other statements and policy decisions to the contrary. For the vast majority of conservatives, this sort of lukewarm approach to social or moral issues marks him as a weakling who they view as lacking the intestinal and moral fortitude to do what’s right, rather than that which is politically easy. For most conservatives, it’s his stubborn lack of philosophical consistency, and on any given day, the question as to which Mitt Romney will show up. In the sphere of economics, Romney likes the fact that people view him as a businessman. I’m not altogether certain that he has a view that comports with those on Main Street so much as the widely held ‘wisdom’ of Wall Street. While it’s fair to say he made a fair amount of money while in the private sector, it isn’t so much that he did so by building or creating, as through trading. That’s not to say that trading isn’t important to the business world, but for the Mom-and-Pop shop, it’s hardly a convincing exposition on entrepreneurial achievement. While he was the Governor of Massachusetts, Romney’s fiscal and economic record was much more muddled. Rather than achieving anything to which he could point as the signature and stamp of his positive effect on the Massachusetts economy, it’s more accurate to say that Romney seemed to be a wave-rider, able to negotiate the swells, but nevertheless providing no new motive power of his own. It’s clear that in the hive-mind of establishment Washington, and the northeast corridor, Mitt Romney is the presumptive leader, but all of this is based on the notion of a widely fragmented conservative wing of the party. If the right succeeds in finding their own new and solid leader, Romney’s chances begin to fade, and few other things would please actual conservatives more. The truth is that while Romney could just as well have been a philosophical stand-in John McCain, and that might be acceptable in normal times, we are not in ordinary times, and conservatives widely recognize the need for creative and energetic leadership whose loyalties reside more with Main Street. Romney’s never owned a small business, or built one from the ground up. 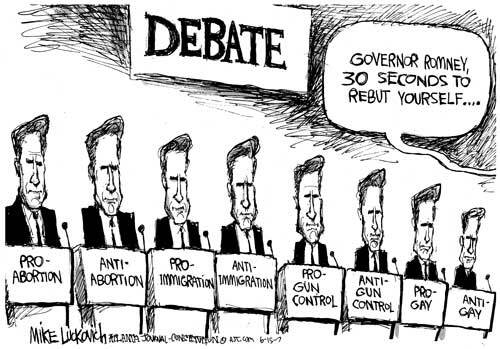 In the midst of the current debt ceiling, debate, Romney has been strangely quiet. You’d think a man who claims to be expert in the realm of business and finance would arrive on the scene to say something more substantial. Here, it seems rather than stick his neck out, he’s prepared to let come what may, again reduced to riding the waves, satisfied to wait and see where they take him. That characterizes the Romney approach to most issues: Lead by following. At the end of it all, what you’re left with is the distinct impression that in his roots and his thinking, he’s simply not one of us, and he knows it, too. On its own, and in any other time, that may not be an intractable problem, but in this coming election cycle, with the country so thoroughly at risk, it’s hard to imagine trusting our nation’s future to a man with so little to recommend. Doesn't sound to me like he has changed positions at all…. Just more blind Media assasinations against Romney in an effort to take out the one Republican that can beat Obama and actually turn this Economy around…. Neither Obama nor Perry have the Pedigree or the ability to fix the mess that we are in today. Romney is the only guy on either side of the aisle that has the experience and the know how…. 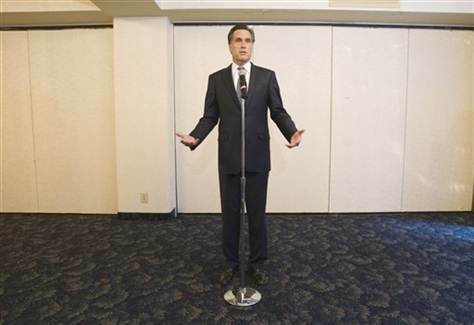 And the Media, the far right and the far left want us to believe that Romney is not suited for the job…. Romney can't win. Too many conservatives, who are reliable primary voters, will not show up for him. It's as simple as that. He'll probably do well in New Hampshire. Then will begin his inevitable decline. He won't do well in the South. He won't do real well in the Midwest or Plains states. He'll bomb in the mountain states, except perhaps Utah. The problem with this particular position, however, is that he's said things previously that put him in favor of cap and trade. This looks like another moistening of a finger to be stuck up into the wind to gauge its direction. I wouldn't be so down on Romney but for one thing: He's not a conservative.